Preheat oven to 375 degrees. In a medium bowl, combine butter and sugar and mix well. Stir in corn syrup, eggs, pecans, rum, vanilla extract and salt. Pour pecan mixture into partially baked pie crust. 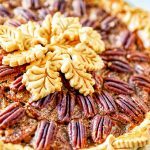 Arrange additional pecans in a circular pattern on top of pie. Place pie on baking sheet and bake on lower rack in oven for 10 minutes. Then lower oven temperature to 350 degrees and bake for an additional 25 minutes or until set. Remove from oven and let cool.